SYNDICATED COLUMN: Why Are the Police Caught Flat-Footed by Right-Wing Extremism? Because They Are Right-Wing Extremists. Not for the first time nor the last, the U.S. has recently been hit by a wave of political violence by right-wing political extremists. People are stunned; aren’t far-right groups like the KKK and Nazi Party relics of history? Clearly not. Package bombs mailed to Democratic politicians and celebrities, the mass shooting at a Pittsburgh synagogue, another mass killing at a Florida yoga studio and the double murder of African-Americans in a Kentucky grocery store have Americans asking two questions: who’s to blame, and why didn’t the people we pay to keep us safe see this coming? The answer to the first question can be answered in part by digging into the second: law enforcement and intelligence agencies have long had a dismal record of tracking the activities of right-wing extremist groups, much less disrupting violent plots before they can be carried out. Turning a blind eye to right-wing violence isn’t new. “Law enforcement’s inability to reckon with the far right is a problem that goes back generations in this country,” Janet Reitman wrote in The New York Times, referencing the Oklahoma City bombing that killed 168 people. Why don’t the authorities infiltrate and eavesdrop upon the “alt-right” with as much vigor as they dedicate to disrupting peaceful left-leaning organizations like Occupy Wall Street and the anti-nuclear nuns? Why do cops spend more time monitoring political cartoonists than Klansmen and neo-Nazis? Why do they pepper-spray pacifists while “standing down”—refusing to interfere—when a Klansman shot a gun at a black counterprotester at Charlottesville? The answer is as obvious as it is terrifying. America’s state security apparatus, military and civilian police, alike, view the left as enemies. To the police, right-wingers are political allies. Which is why the police routinely creates “safe spaces” for white nationalist violence. Crazy as it sounds, they even form working partnerships with racists and anti-Semites. Washington D.C. police conspired with far-right groups Project Veritas and the Oath Keepers to use doctored evidence to prosecute people arrested for protesting Trump’s 2017 inauguration. There is evidence that the California Highway Patrol is working with the Traditionalist Workers Party, a neo-Nazi organization. In June 2017 U.S. Department of Homeland Security officers at an alt-right rally in Portland, Oregon worked in tandem with right-wing militia goons to arrest liberal counterprotesters. Violent right-wing extremists don’t just work with the police. Many times they are the police. Most cops are conservative. Quite a few are far, far right. “Federal law enforcement agencies in general — the FBI, the Marshals, the ATF — are aware that [right-wing] extremists have infiltrated state and local law enforcement agencies and that there are people in law enforcement agencies that may be sympathetic to these groups,” said Daryl Johnson, lead researcher on an Obama-era DHS report. The FBI was concerned, Johnson said last year, but local police departments don’t seem to care. “For some reason, we have stepped away from the threat of domestic terrorism and right-wing extremism,” Samuel Jones, a law professor at the John Marshall Law School, told The Intercept. “The only way we can reconcile this kind of behavior is if we accept the possibility that the ideology that permeates white nationalists and white supremacists is something that many in our federal and law enforcement communities understand and may be in sympathy with.” It’s more than a “possibility”—police unions overwhelmingly endorsed Trump. The military leans right too. A 2017 Military Times survey found that one out of four servicemen and servicewomen have personally observed white nationalist activist among the ranks. According to a 2018 Pro Publica report a secretive neo-Nazi group called the Atomwaffen Division, a paramilitary organization accused of five murders, has infiltrated the armed services. Veterans voted 61%-to-34% for Trump over Clinton. 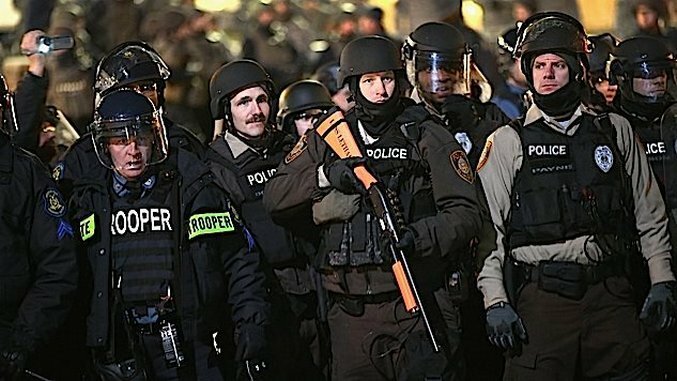 A 50-50 left-right nation ruled by right-wing cops and soldiers is about as good an idea as a black neighborhood policed by all white suburban cops. But what can we do about it? Part of the issue is self-selection. As local policing has evolved from a protect-the-public “guardian” model to a military-influenced “warrior” mentality, the personality type of recruits and applicants has increasingly skewed toward those with authoritarian tendencies. Your local PD isn’t hearing from many Bernie-voting hipsters. But the biggest problem is the message from the top. I’m not just talking about Trump. Liberal Democrats like Obama and Pelosi and likeminded media personalities like those on MSNBC are no less effusive about supporting the troops and first responders while turning a blind eye to the terrible truth that many of rank-and-file soldiers and police officers, as well as their leaders, are rabid right-wingers who ought not to be allowed to own a gun, much less legally train one on a left-leaning protester at a rally. Both major parties share the blame for atrocities like Pittsburgh. This entry was posted in Blog, Columns and tagged Conservatism, FBI, KKK, Klan, neo-Nazi, Pittsburgh shooting, Police, political violence, right-wing extremism, synagogue shooting on November 6, 2018 by Ted Rall.